Thank you for your interest in our Dunwoody, GA law firm. Our personal injury attorneys in Dunwoody, GA are focused on helping persons that have been injured in car wrecks and tractor trailer wrecks. Our injury attorneys are seasoned trial lawyers and we have tried cases in Dunwoody, Johns Creek, Duluth, Norcross and surrounding areas. The Dunwoody, GA area was pioneered in the early 1830s and is named for Major Charles Dunwody (1828–1905). Charles Dunwody originally returned to Roswell after fighting in the Civil War, in which he fought for the secession of the Confederate states. An extra “o” was added with the incorrect spelling of the name on a banking note and that is why the city name is spelled as it is. Dunwoody became incorporated as a city on December 1, 2008. Geographically, Dunwoody lies at the northern tip of DeKalb County, bounded on the north and west by the Fulton County line, Interstate 285 on the south, Peachtree Industrial Boulevard on the southeast, and Peachtree Corners (in Gwinnett County) on the northeast. Why Hire a Dunwoody Injury Lawyer? If you have been injured in an accident, and feel you have a personal injury claim, then it is important that you hire an experienced personal injury lawyer in Dunwoody to handle your case. Whether it was a DUI related accident, motorcycle accident, tractor-trailer accident, texting accident, or anything else we are here to serve you. The best part is that when you hire Link & Smith, P.C. we will not charge you a dime unless you receive a settlement. We want to help people, even if they think they cannot afford to hire us. There are no up-front costs, and we simply collect a percentage of your settlement! 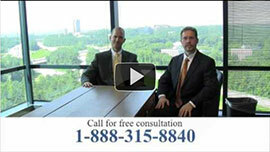 Our Dunwoody personal injury lawyers specialize in Atlanta area personal injury cases. We have over 40 years of combined experience and we are proud to assist you in your personal injury claim. If you are not able to come to our location we will gladly meet you at your home or another location convenient to you to discuss your claim. Our results speak for themselves!